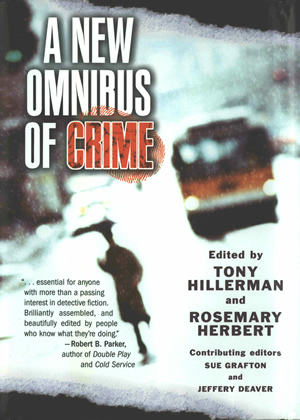 A New Omnibus of Crime was edited by Tony Hillerman and Rosemary Herbert. They also co-edited The Oxford Book of American Detective Stories. Contributing editors to this volume are Sue Grafton and Jeffrey Deaver. It was published in 2005 by Oxford University Press in New York, New York, USA. This is a hardcover book with dust cover. The cover, designed by David Stevenson, features a photograph by Photonica of a blurred city street during a snowstorm. A figure with an umbrella is running in the foreground, with a city bus or trolley behind and to the right. At the top left of the photo is the book title; the word "CRIME" is printed in red over a red fingerprint. The editors' names are printed at the bottom right, and at bottom left is a quote about the book from Robert B. Parker. The photograph wraps around the spine of the book, where the title, Hillerman's and Herbert's names, and the publisher's imprint are printed. On the back cover, in white on a magenta background, the Contents (title and author) are printed in white above the book's bar code. The front flap contains a description of the book contents, which continues onto the back flap. The back flap also displays the editors' photograph, taken by Marie Hillerman, and biographies of Tony Hillerman and Rosemary Herbert. The inside front and inside back covers are blank. Binding: Red paper-covered boards with black cloth tape over the spine. The title and editors' last names are printed on the spine in metallic purple.